Look no further, HONOR Malaysia’s special deal offers the most complete Valentine’s Day bundle for you and your loved one! In the spirit of the upcoming Valentine’s Day, HONOR, the leading global mobile e-brand, announced its limited-time, exclusive Valentine’s Day bundle package – a pair of HONOR 10 Lite in Shiny Red (3+64GB) and Sky Blue (3+32GB), and a pair of HONOR Band 4 Running (in Red and Green), for a total combined priced of ONLY RM1,437! Originally purchasable at RM1,706, customers can get the HONOR Valentine’s Day Bundle exclusively on hihonor.com/my from 12th to 14th February. 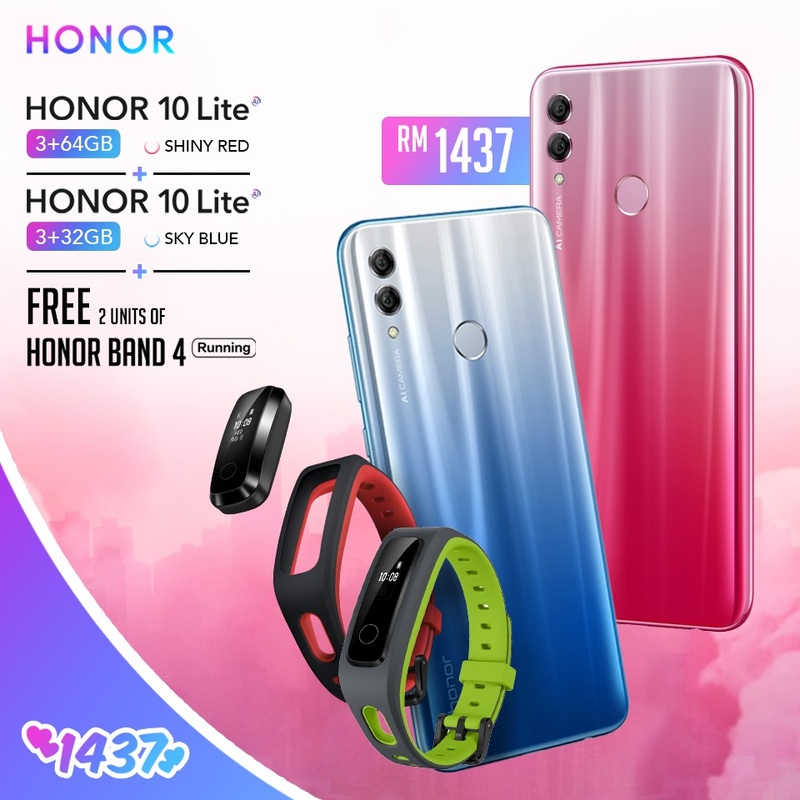 The limited-time bundle price of RM1,437 is a special offer from HONOR Malaysia to symbolize the expression of “I Love You Forever”. Impress your loved one with the most unique matching gifts, because now, you can both strut your styles in pairs with the alluring colors of the fashionable HONOR 10 Lite; seamlessly complemented with the matching HONOR Band 4 Running for a complete, trendy flair. The HONOR 10 Lite was launched just a few weeks ago by HONOR Malaysia, introducing fans to its unique 24MP AI-front camera and the brand’s first device with the dewdrop design to keep you #24HrinStyle. HONOR’s ‘Lite’ series is in its own trendsetting league. Equipped with one of the most stylish and unique gradient-colored back designs ever produced, this fashionable series is a product of the latest trend and smartphone technology, a truly perfect device made for Malaysians. That’s not all! Starting from the 4th – 14th February, there are also other amazing promotions and free gifts for each purchase of other innovative devices from HONOR. Offers are inclusive of the recently launched HONOR View20, featuring three world-first technologies namely the 48MP camera with advanced rear 3D camera, ‘Punch-hole’ in-screen front camera design and a high-performance 7nm Kirin 980 chipset; the hot-selling HONOR 8X in red and black which pairs flawlessly with an HONOR Band 3 and HONOR AM61 Bluetooth earphone respectively, and many more. Finally, DO NOT miss out the exciting mini-games on HONOR Malaysia’s website at hihonor.com/my, where you may stand a chance to win crazy amounts of hihonor.com/my vouchers, Touch ‘n Go vouchers and more to spice up your Valentine’s shopping spree while giving you your money’s worth! Those who are keen are urged to act quickly before the promotion period ends. Customers can drop by HONOR Malaysia’s official e-commerce website and information portal at http://hihonor.com/my to make their purchases. For more information on the exciting promotions, HONOR devices or HONOR Malaysia, please visit HONOR’s official e-commerce website and information portal at http://hihonor.com/my, or simply follow their official Facebook page at https://www.facebook.com/HonorMY/ for regular updates.